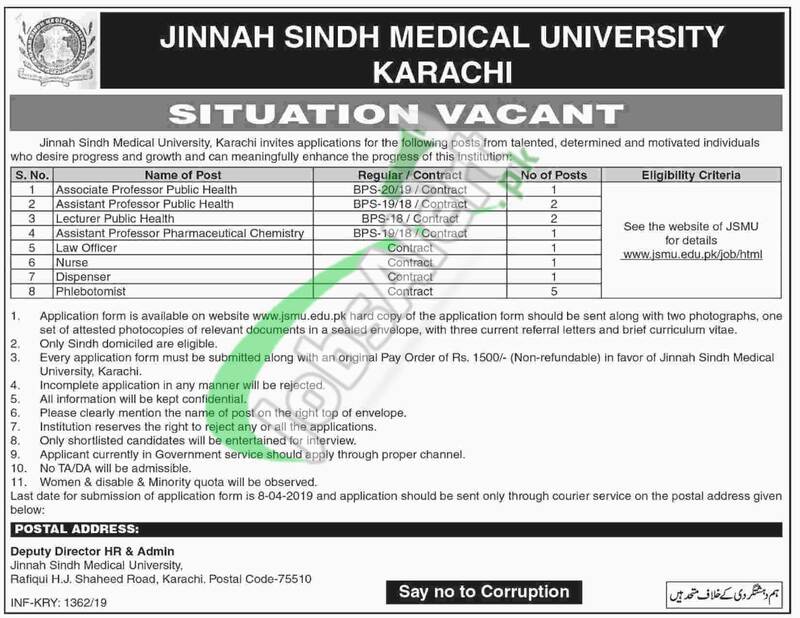 Here you'll get JSMU Jobs 2019 Application Form Download Online for the latest jobs in Jinnah Sindh Medical University Karachi on contract basis. Jobs in JSMU to apply are (Associate Professor Public Health, Assistant Professor Public Health, Lecturer Public Health, Assistant Professor Pharmaceutical Chemistry, Law Officer, Nurse, Dispenser, Phlebotomist). Candidates from all over Pakistan possessing qualification from PhD / Masters to Graduation with relevant field experience are welcome to apply on prescribed form along with all relevant documents before the last date 08th April 2019.